Any visit to Yale University begins here at the Visitor Center. 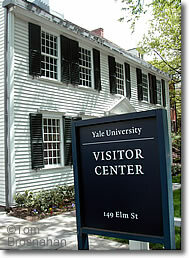 The Yale University Mead Visitor Center, 149 Elm Street in New Haven CT (map) is the place to go for information about Yale, its campus and its programs. Their handy map makes it easy to get around the campus. From I-91 Exit 3 (Trumbull Street), follow Trumbull Street until it ends at the fourth traffic signal. Turn left onto Prospect Street which, after one block, becomes becomes College Street, and after two more blocks, meets Elm Street. Turn left onto Elm Street and look for the Visitor Center in this block at number 149, opposite New Haven Green.